Roman wrote earlier about one section of Resurrection Creek and here I'll cover another lower section. Leave a bike in downtown Hope and drive to the Resurrection Pass trailhead, about 5 miles away. Hike up the Resurrection Pass trail, passing the impressive stream restoration work that is on-going to repair the damage from placer gold mining. Put on the creek near where the trail begins to diverge from the creek. From this point down to Hope is about 8 miles of generally Class II water with the biggest hazards being sweepers and logjams. There is one spot in the midst of the restoration section that is particularly ugly, with a drop immediately upstream of an gnarly logjam. A swim here would be bad news. We did some creek clearing on July 17th 2007 but didn't get everything. The worst stuff is on the lower section as you get closer to Hope. There are some sweepers and logjams that you've got to portage around but they are easy to see as you approach. The highlight of the run was watching the impressive kings and numerous pinks passing by under your boat. As you approach Hope, you'll run a gauntlet of lure-slinging anglers, so bring a patch kit! If you are looking for a bit more excitement, the section above the restoration area has more to offer. See Roman's post of May 2007 for details. Last edited by bradmeiklejohn on Sat Sep 08, 2007 7:24 pm, edited 1 time in total. Resurrection Creek is very good right now, from bridge at 7 miles up Resurrection Pass Trail to Parking Lot Bridge. Two hour hike in and two hour float down with 20 minutes spent scouting the Class IV "Cascades" (labeled on USGS map between Wolf and Willow Creek ). It is a lot like upper Ship Creek in high June/July water (splashy with small boulders punctuating the consistent drop), but with bigger water (more volume). There is really no wood. It drops about 700 feet in 7.7 miles; however, the Cascades section drops almost 100 feet in half a mile. The Cascades Section has about five big drops: the first is a river wide ledge; the second is like the last drop in the lower Ship Creek canyon; the third and fourth are also big and very technical, requiring a river wide zig zag and drop-in; the fifth is a bit like a stair case. There is also a lower canyon with a Class III hole as the river makes a right and then some big rocks as the river leaves this lower canyon. The restoration project below the lower canyon (the last mile and a half or so) includes some fun drops followed by a fast and steep channelized section. It reminded me of Sheep Creek in the Talkeetnas, but less hectic, less intense. BIgger than upper Ship Creek but smaller than Six-Mile. This is well worth doing. I am hoping to go back and hike the next 7 miles for a 14 mile run, all at the 100 foot/mile gradient. Six Mile was running at 10.6 feet, which is medium flow. I thouht Resurrection had some good flow to it (maybe around 750 cfs?). We never had to "starfish" on our tubes, and were never stuck on gravel bars. I have talked to two other parties that ran it at low flow and hit many rocks and had to get on their tubes. Anyway, it's really good right now if you like the Sheep Creek run and it's pretty darn close. Anthony, Paul and I floated the upper section of Resurrection Creek down from about 4.5 miles up the trail back to the trailhead yesterday 7/10/08. Good high flow, but a couple of strainers to watch out for, one towards the end of the short canyon just above the restoration area blocks the main flow to the right of a large mid stream boulder. Makes the canyon super sketchy, especially if you are swimming, could sneak around river left of it, but wouldn't be good to get flushed into it swimming or otherwise ( hope to try to remove it on sunday ...) In other words scout the canyon for sure or portage it (we did). The canyon starts just after the creek divides and rejoins around an island -- the trail is close and easy to hike up to the top of the cliffs to have a look - better still check it out on your way up, backtrack uphill from a large beaver pond on your left back to the top of the hill for a look. Also another couple of strainers choke out all but the middle of the creek about 1/2 mile upstream of the canyon, watch for green cottonwood branches waving in the current ... Besides that it is fast and fun right now. Brad M. and I hiked past Fox Creek from the Hope side (4 hours). "55 Ways to the Wilderness" says that Fox Creek Cabin is 12.25 miles from Hope Trailhead. We walked another half hour or so, to where you can look down at Resurrection Creek from a high bluff about 30 yards from the trail. From there the creek is teeny tiny (see photo) and winds into several mini-canyons that are exciting with their blind corners and lack of eddies. But the flow is so low you are always under control, which is a good thing because there are occasional woody edges and four portages (see above). This little run is so-named as it's reminiscent of NW Wyoming creeks -- small and woody in boreal forest, clear water, splashy and rocky. We agreed that this is in the same family of creeks as upper Ship Creek above the Arctic to Indian Trail (NOT the Ship Ck canyon sections), and S Fork Eagle River downstream of the tundra section. Is it worth hiking in for? The section ("Cascades") below the bridge at 7 mile is very good, too (see my earlier post above, from May 28th, 2007), with one bad piece of wood in the Cascades section (several PR 4 drops). This must be portaged but the other four drops in Cascades are all clean and doable. But also portage-able on river right. Finally the reach Montymykolas describes ("Resurrected" -- see post immediately above) that goes through the canyon between Palmer Creek and Rimrock Creek, then down to the parking area bridge through the reclaimed section is also clear of wood and good to go. All three sections ("McCarthy's Forest" -- 4 hour hike in, "Cascades" 1.5 hour hike in, "Resurrected" < 1 hour hike in) are suitable for intermediate boaters as a group, or as Brad points out, for beginners following experienced boaters who are ready to make the bump up to something more technical than Twenty-mile and Eagle River. Six Mile Guage was reading about 10.3 feet yesterday and there was plenty of water in Resurrection. Recap: 2 hour drive to trailhead, 4 hour hike and a 4 hour paddle of mostly constant PR 2-3 with PR 3 in the "Class III" lower canyon and PR 4 in the Cascades section (which can be portaged and scouted on river right) -- look for big boulder, biggest on entire run, on river right to signal Cascades are coming about 20 minutes or so downstream of 7 mile bridge. Also good preview of Cascades from trail on hike in. Yesterday (8/17/09) three of us floated Resurrection Creek from the 7-mile footbridge down to the Resurrection Pass Trailhead. The Sixmile Gage read ~9.4', and we encountered Class I-II, low water and bony conditions above the Cascades. The three drops on the Cascades are III+, IV and IV, and looked too low to run. At the bottom of the second drop, most of the water flowed under a large log spanning the channel 10-12 inches above water level. Except for a sneaky slide down far right of the upper drop we portaged the drops at river level on river right and were able to to float the sections between drops. Below the Cascades, bony conditions continued; at times it seemed like there were more salmon than water in the creek! The rest of the way down was Class II with a couple of Class III drops here and there. All agreed that the previously stated 10 feet at Sixmile is probably the minimum needed to guarantee good flow on Resurrection. Ran Resurrection today. I hiked about 5 miles up the trail thereabouts and floated down to Hope. Some fun drops and wavetrains but nothing too scary. Some sweepers which can be avoided. Near the finish I had to portage a couple of trees which completely block the creek. With six mile running high there is plenty of water in Resurrection. Any reports from Resurrection River from this spring to share? Walked upstream of the foot bridge at the Resurrection Pass Trail head for about 15 minutes before we put in. Fun Class II punctuated with class I. Some boulders to dodge here and there and some avoidable strainers around. 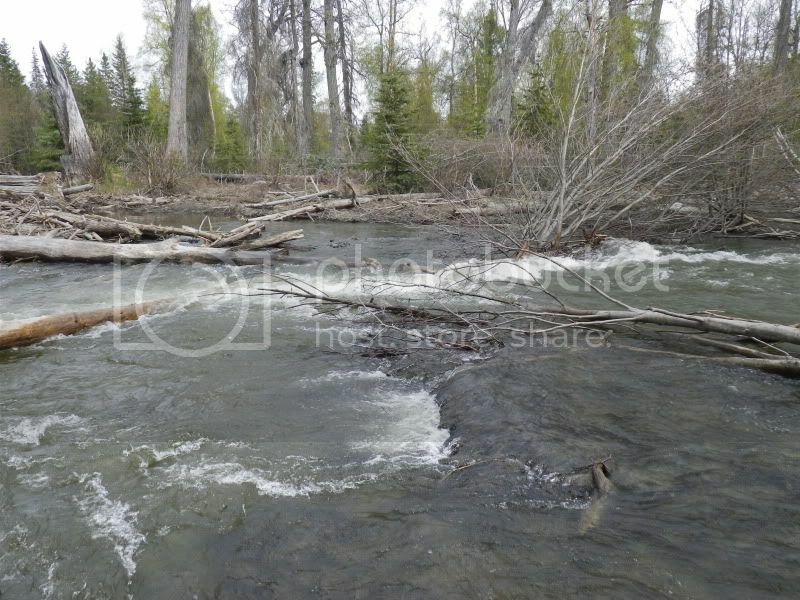 Lots of wood in the river after the mini canyon ends close to Hope. One channel splits into 2 or 3 and there are a couple unavoidable jams. I'd recommend pulling out just after the canyon; it's not much further to walk into hope. Scout it if you run the last section. Our group took about 3.5 hours. Here is a picture of one of the jams.